Chocolate Covered Strawberries have never been easier! Thanks to the Instant Pot, melting the chocolate and keeping that chocolate warm and melted is done with ease! 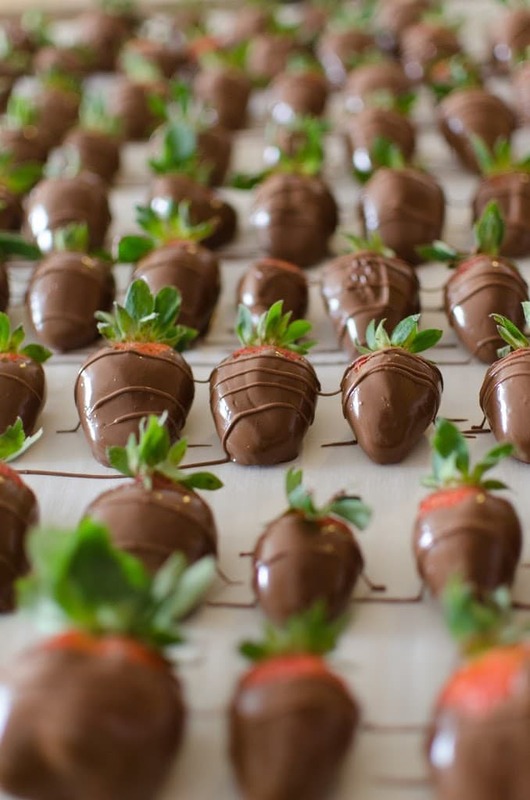 Save some money this Valentine’s Day and make your own Chocolate Covered Strawberries. Chocolate Covered Strawberries- Quick and Easy with the help of the Instant Pot! I remember being in High School and coming home from church on Sundays, making a treat and then driving around and delivering the treats to all of my friends. My favorite Sunday’s were the ones that fell around holidays. I mean, with a cookie cutter and some icing, you can make a Sugar Cookie festive for any occasion! Around Valentine’s Day though, it was always (and will always be!) Chocolate Covered Strawberries. I love Chocolate Covered Strawberries for a handful of reasons. First, they seem super fancy, but really they are SO easy to make! Second, around Valentines day, strawberries are always on sale. Which means this can be a fairly inexpensive dessert. Especially when compared to how much you would pay a bakery for Chocolate Covered Strawberries! With my Instant Pot (if you don’t have one yet, jump on that bandwagon already! 😉) dipping strawberries in chocolate literally could not be any easier! The chocolate melts quickly and evenly.. and get this.. it stays melted for as long as you need it!! No more rushing to dip before the chocolate hardens. I’ve got all the tips you need, coming right up! I have melted chocolate in my Instant Pot for many different things (holiday nut clusters, FONDUE!) so I have all the tips you’ll need right here. What is the best kind of chocolate to use when dipping strawberries? The best kind of chocolate is dipping chocolate or almond bark. My local grocery store sells blocks of dipping chocolate which is what I buy. I recommend the dipping chocolate or almond bark because it’s purpose is to be melted and then dried. It generally dries very quickly, too. You can find dipping chocolate from white to milk all the way to dark. If you don’t have access to dipping chocolate and you’d rather use chocolate chips over almond bark, you’ll want to add either shortening or coconut oil. A good rule of thumb is 1tbsp of shortening or coconut oil per cup of chocolate chips. This will help the chocolate chips harden again after being melted. If using chocolate chips, you can use milk chocolate, semi-sweet or dark. Whatever you like the most. As shown in the cute video above (isn’t my little lady just the cutest? 😍 Her curls kill me.) we will be using our Instant Pot as a double boiler. Turn the Instant Pot onto the Sauté setting. You will either want to use it on LOW or NORMAL setting. Don’t push it and go to HIGH, that will bring the water in the Instant Pot to a roaring boil and hot steam and water will spurt out from beneath the bowl. I usually use the NORMAL setting, and just let the chocolate just sit for 5-10 minutes before stirring. Then I stir occasionally until the chocolate is smooth and melted. Now that the chocolate is smooth and melted, hit the cancel button to turn the Instant Pot off. Then hit the keep warm button. This will turn the heating element on just enough to keep your chocolate melted for as long as you need. NOTE: Sometimes with the drastic change in heat the glass bowl will get ‘stuck’ in the metal liner of the Instant Pot once the sauce function has been turned off. If this happens, simply turn the saute function back on and within about 3-5 minutes the glass bowl will be loose again. Make sure to handle the glass bowl with hot pads! It will be hot! Chocolate Covered Strawberries have never been easier! Thanks to the Instant Pot, melting the chocolate and keeping that chocolate warm and melted is done with ease! Save some money this Valentine's Day and make your own Chocolate Covered Strawberries. Instant Pot Instructions: Pour approx 2 cups of water into the bottom of the Instant Pot liner. Place a glass bowl on top of the liner. The bottom of the bowl should just fit inside of the Instant Pot, the top should be above the top of the liner. Stir chocolate occasionally until smooth, about 10-15 minutes. After the chocolate is smooth, press cancel and then hit the keep warm button. Either allow to dry at room temperature or toss in the fridge (30 min) or freezer (15 min). Will keep in the fridge for 2 days or in the freezer for 2 months. Microwave Instructions: microwave chocolate (and shortening/coconut oil if using chocolate chips) in a glass bowl. Microwave for 30 seconds at a time until completely melted, stirring at each 30 second mark. Microwave Instructions:microwave chocolate (and shortening/coconut oil if using chocolate chips) in a glass bowl. Microwave for 30 seconds at a time until completely melted, stirring at each 30 second mark.